Now that it’s summer, the family is probably itching to head outside and have some fun on the deck. Whether you host weekly barbecues or have an above-ground pool at one end, your deck is a hub of summer activity. 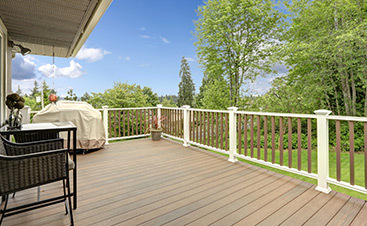 Since the sun is blazing and the temps are rising, you want your deck to be in tip-top shape for your family and friends to enjoy as the summer wears on. Learn more about the top 10 deck improvements for your New Jersey deck for fun in the sun this summer. First things first: if your deck weathered a particularly rough winter, then it’s likely due for a refinishing job. Getting your deck professionally sanded, pressure washed and stained will give it new life for another summer. 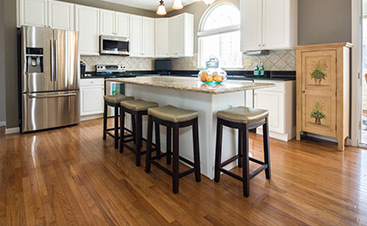 Smoothly sanded boards are perfect for running across in bare feet. A new coat of stain or paint gives your deck new life, and you can experiment with new colors for a fresh take on your outdoor space. If you’ve got loose boards or rickety deck stairs, you definitely want to make repairs before the summer gets into full swing. Have a professional assess your deck needs and make the necessary repairs. That way, you can get outside and grill or chill without worrying about tripping and falling on your deck. Furniture on your deck goes a long way toward making it a fun place to chill out and drink a cold beverage with friends or read your favorite summer novels. Upgrade your outdoor living room with new furniture and pillows to give it a comfortable vibe. 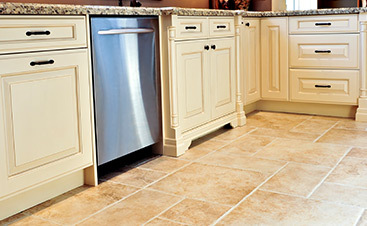 You may never want to use your indoor spaces again. Potted plants bring texture and character to your deck. They are particularly useful when you have a raised deck that isn’t level with the plants in your backyard garden. Choose potted trees or plants with tall shoots that give some privacy and visual interest to the deck area. 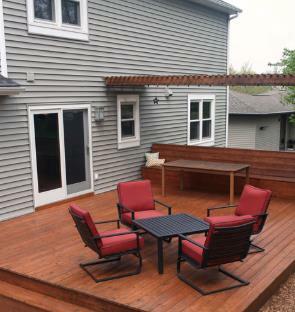 Screening in your deck makes the space functional throughout the summer, even on rainy days. Opt for a full roof and screen that gives you more thorough protection from the elements, or choose a simple, decorative privacy screen to add above your deck rail. Is your grill older than your youngest child? You may want to consider replacing your grill if you notice that it has rust spots or burns through propane at a really fast rate. Find a newer model that allows you to smoke a chicken or that has burners so you can prep your favorite veggie sides outdoors. Give your pet some love with an outdoor puppy corner on your deck. After all, the pets are family members, too. Set up his food bowl and water – this works best on a protected deck that doesn’t attract other animals – and let him come and go as he pleases. Just don’t forget the doggie door! Incorporating color to your deck makes it a fashionable room that acts as an extension to your indoor decorating scheme. You can use color in small pops for dramatic effect or bold strokes to really set the stage. Choose colored accessories, like pillows and rugs, that add comfort and color as well as a patterned design element. Consider painting an exposed wall or one side of your deck screen in a bold hue that adds a whole new element of design. Chances are, if you’re already maintaining an outdoor garden, you cross your deck each time you head to and from it. So why not add a potting corner to your deck to allow easy access to the items you grab most? Add an outdoor table and some storage to set your garden tools, pots and soil away. Then simply break everything out when you need to use it and you’ve got all of your necessities right at hand. Deck lighting serves an important function for both ambience and safety. Choose outdoor deck lighting that meets one or both of these needs to keep your family safe and relaxed while outdoors. Ambient lighting can include twinkle lights that shroud your outdoor dining area in romantic vibes. Don’t forget to add safety rope lighting to rails and stairs to keep your eyes on the guiding path around the deck itself.